Someone needs to civilize the Wild West of virtual reality. 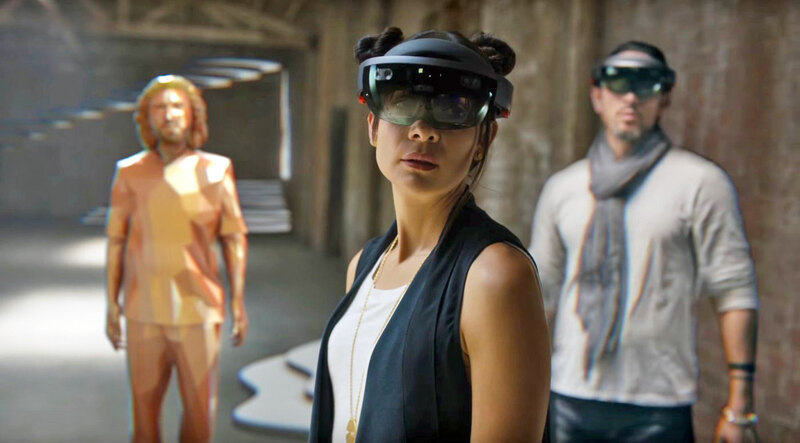 In a move we should have seen coming from a mile away, Microsoft announced that it will be opening up the Windows Holographic platform, which powers HoloLens, to other companies. Those partners will be able to build AR headsets like HoloLens, full-fledged VR headsets like the HTC Vive, as well as components powering those devices. It's similar to Microsoft's original approach to PCs with Windows -- build the operating system and let others go wild with hardware -- as well as its push for new form-factors with the Surface. With the VR market still feeling like the Wild West, a bit of stability from Microsoft could be a huge help. Just as we've seen with desktops and mobile, the virtual reality market boils down to a few big platforms vying for dominance. Facebook has Oculus; Valve and HTC are betting on SteamVR for the Vive; Sony has its upcoming PlayStation VR; and Google is focusing on its DayDream platform for Android. At this point, Oculus and Sony are practically Apple-like, refined pieces of consumer hardware on platforms that nothing else can run on. Valve's SteamVR and Google's DayDream, on the other hand, are open to a variety VR headsets (you can already run some SteamVR games with an Oculus Rift). And Windows Holographic is ... well, Windows. "Nobody has built an operating system for this generation," Microsoft's Terry Myerson, executive vice president of its Windows and devices group, said during a Computex press conference. That alone makes Microsoft's platform more compelling than the competition. While its partners likely won't have nearly the amount of freedom as they would with something like SteamVR, there's a certain amount of confidence in building for Windows. And until standalone Android VR headsets hit the market, Windows is the only platform that can power an AR/VR device on its own. Surprisingly, Myerson told us that a third-party company might even make a consumer HoloLens before Microsoft. "Either way, that's fantastic," he said. While we've been impressed by HoloLens demos, the hardware still has some issues, particularly its very narrow field of view. If another company manages to come up with a better solution before Microsoft, that's ultimately a good thing for the entire Windows Holographic platform. At the moment, Microsoft has a decent stranglehold on VR. Both the Vive and Rift can only run on Windows, much to the chagrin of Apple fans. But it's another thing entirely to own the entire VR pipeline, so that developers can build using Windows Holographic tools and consumers will be able to have VR experiences without juggling other storefronts from Oculus and Valve. Simplicity is what virtual reality needs at the moment, and Microsoft has a good shot at making that happen. The biggest benefit of Microsoft opening up Windows Holographic? We'll see plenty more companies getting into the VR game, which will hopefully lead to more innovative products. Ultimately, it'll be far better for consumers if VR isn't something that only a handful of companies like Facebook control. Partners already onboard with Microsoft's vision include Intel, AMD, Qualcomm, Acer, ASUS, Dell, Falcon Northwest, HP, Lenovo, MSI and others. There are reasons to be skeptical: Microsoft's attempt to bring Windows to the mobile world has been fraught with failure, to the point where it's basically given up on smartphones. There was no mention of mobile at the Build developer conference, and I've heard from Microsoft reps that it's just not something they're thinking about in 2016. Microsoft has also backtracked from its Nokia acquisition in major ways, after laying off nearly 10,000 employees, writing down $8.5 billion from the deal (between this year and last year), and selling off Nokia's feature phone business. The difference with VR and AR, though, is that Microsoft isn't several years late to the party. With HoloLens, it's actually ahead of the curve -- it's a product that likely won't have many consumer applications for years, and at $3,000 for the developer edition, it's more expensive than today's VR headsets. HoloLens is more comparable to Magic Leap's mysterious augmented reality technology, which still hasn't been publicly shown. Microsoft has previously said that Windows Holographic is fully VR-capable, we just haven't seen any examples of that yet. We might not have to wait long, though. At Computex, Myerson teased that it's been working closely with HTC on a consumer VR product. And during its keynote and demo videos, Microsoft showed off people wearing the HTC Vive running Windows Holographic. The idea of having VR and AR devices working on a single platform is pretty compelling. Microsoft gave us a glimpse of how it's envisioning the evolution of the HoloLens platform in the video above. 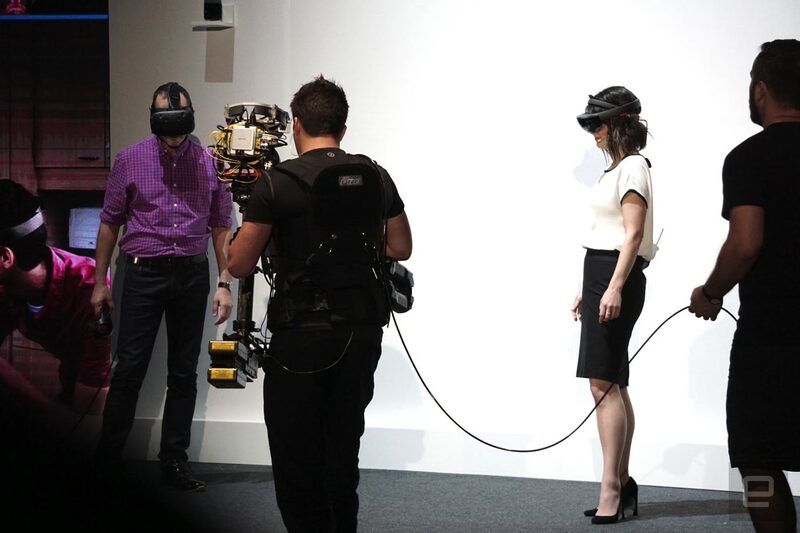 It shows someone wearing a HoloLens headset collaborating with a colleague wearing an HTC Vive, and another colleague wearing HoloLens in another part of the world. Together, they were able to design a retail space virtually, almost as if they were in the same room with each other. Sure, it'll be years before that sort of collaboration is possible, but what's important now is that Microsoft is building towards that future. And hopefully, that'll mean cheaper and better access to virtual worlds for everyone.